Here’s an easy and healthy dinner idea! 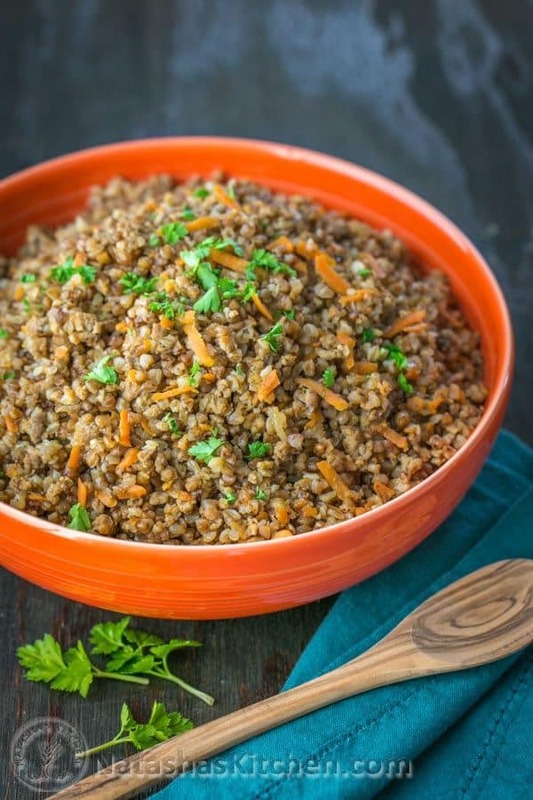 We are buckwheat fans at our house and pretty soon buckwheat will need it’s own category on the blog 😉 (Click Here to read more about why buckwheat is so good for you). 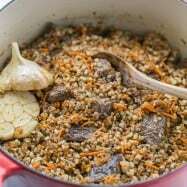 I love that this buckwheat and pork recipe is made in one pot. This means less dishes to clean and less fuss at the stove. 1. Heat a dutch oven over medium heat. Once it’s hot, add 1 Tbsp olive oil. Add well drained buckwheat and saute, stirring occasionally for 3-4 minutes. 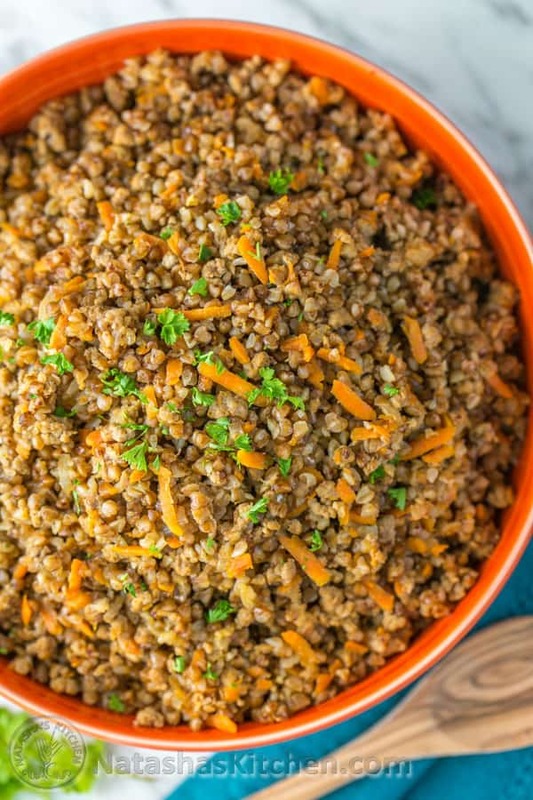 Remove buckwheat from the pot and set aside. 2. In the same pot add 2 Tbsp more olive oil. Add diced onion and grated carrot and saute for 4-5 minutes or until softened. Add ground meat and continue to saute until lightly browned and cooked through. Add 2 Tbsp of ketchup, 2 minced cloves of garlic and combine well. 3. 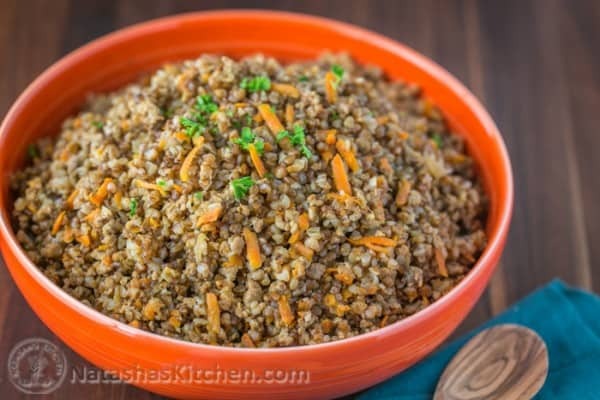 Spread toasted buckwheat evenly over the top of the mixture and cover it with 1 1/2 cups boiling water. Sprinkle the top with 1/2 tsp salt, 1/4 tsp of black pepper and 2 bay leaves. 4. Close the pot with a tight fitting lid. Simmer for 15 min or until kernels are soft and fluffy. Remove from heat and let it stand covered for an additional 10 min without mixing, then stir and serve. Here's an easy and healthy dinner idea! I love that this recipe is made in one pot. This means less dishes to clean and less fuss at the stove. 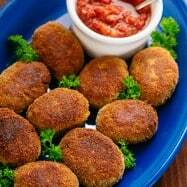 This is a simple, everyday type of recipe that uses basic ingredients and the results are nothing short of delicious. P.S. This recipe is 100% gluten free. Heat a dutch oven (or heavy-bottomed pot) over medium heat. Once it’s hot, add 1 Tbsp olive oil. Add well drained buckwheat and saute, stirring occasionally for 3-4 minutes. 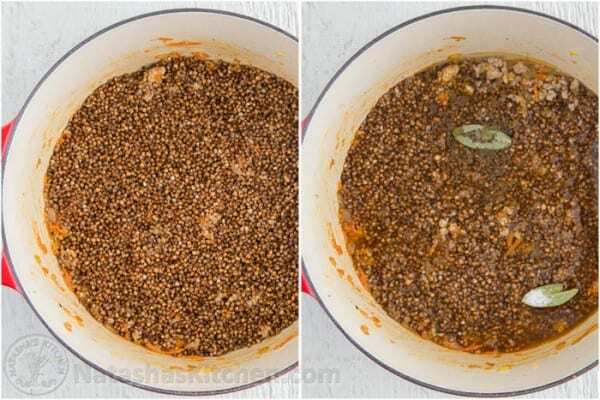 Remove buckwheat from the pot and set aside. In the same pot add 2 Tbsp more olive oil. 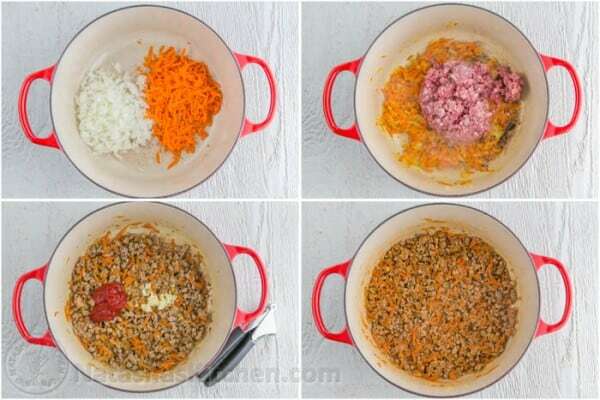 Add diced onion and grated carrot and saute for 4-5 minutes or until softened. 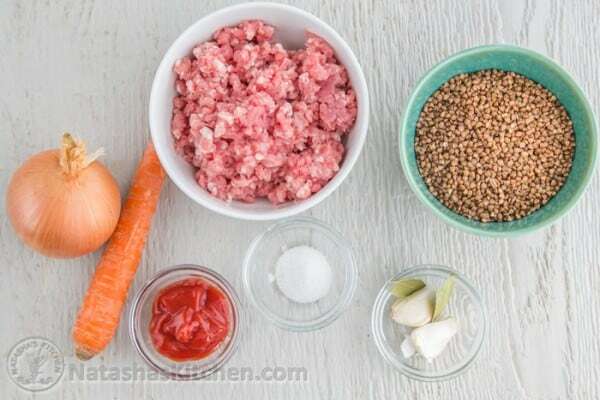 Add ground meat and continue to saute until lightly browned and cooked through. Add 2 Tbsp of ketchup, 2 minced cloves of garlic and combine well. 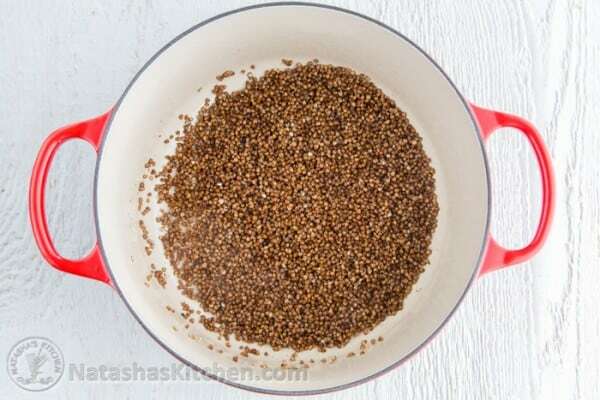 Spread toasted buckwheat evenly over the top of the mixture and cover it with 1 1/2 cups boiling water. 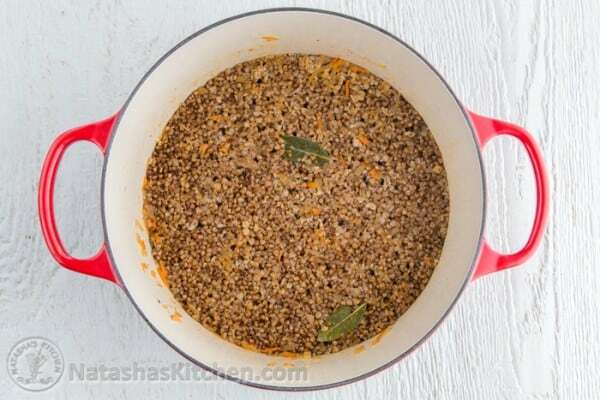 Sprinkle the top with 1/2 tsp salt, 1/4 tsp of black pepper and 2 bay leaves. Close the pot with a tight fitting lid. Simmer for 15 min or until kernels are soft and fluffy. Remove from heat and let it stand covered for an additional 10 min without mixing, then stir and serve. * This OXO garlic press is self cleaning and makes garlic work a breeze. Thanks for this amazing recipe! I’ve made it twice already, and it’s a total hit! My husband loves it! I was wondering if you could make it in a rice cooker. I was planning to saute everything over the stove and then let it cook in the rice cooker. Do you think it’ll work? What about the amount of water? I’ve just made it in the rice maker just as I told you, and it turned out delicious!!! I sauted everything over the stove, poured it in the rice maker and forgot about it until it was done. I love the flavours in Eastern European food, that kind of sour, pickle-y note seems to give great depth without adding spice or wine! So thank you so much for sharing your wonderful recipes with us, it really means a lot. And super tasty! I’ll be back! 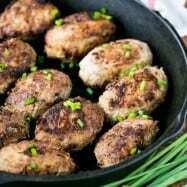 Natasha, since I married a Russian wonderful man, the Kasha is one of the dishes that I introduced my kids since little. Some said don’t like it. I always make it the traditional way. But this time is my First one pot meal dish. I used ground turkey and instead of water I used chicken broth. 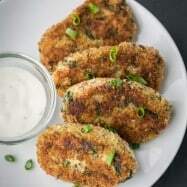 Family loves this recipe now. I make a lot of your recipes. Dora, did you use the same proportions of Chicken Broth as water? Mmm..yumm! I love buckwheat! Grandma and mom always made it with butter. So, I stick with it. Also love to add mushrooms to sauteed vegetables. Do you think it’d be good with grou d beef? 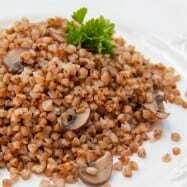 We don’t eat pork and I’d love to introduce buckwheat in our diet.